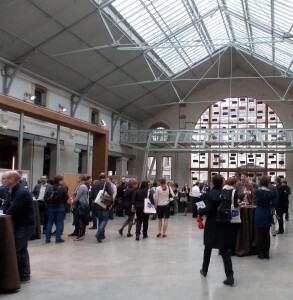 On 13-15 November 2013, the 4th International Conference of the EUSPR on ‘Understanding differences in prevention outcomes’ was held in Paris, France. The conference focused on the important role of modifiers of prevention outcome, and examined the best ways in which diversity can be incorporated into research and practice. We had an exciting and varied programme with over 70 presentations from 18 European countries as well as from the USA and South America. Plus, with 175 attendees, 2013 is our most attended conference. Plenary speakers presented the latest findings from research in Germany, Italy, Poland, UK, and the USA, which investigated modifying factors such as age, gender, ethnicity, family and socioeconomic status. Photograph: Plenary session 2. From left to right – Dr Jeanne Poduska, Frederick Groeger-Roth, Prof David Foxcroft (Session Chair), and Dr Katarzyna Okulicz-Kozaryn. 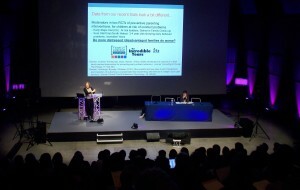 The conference was very well received, with attendees praising the programme and networking opportunities. One attendee said ‘The EUSPR International conference has turned into an annual “must” for professionals who want to be in the front of prevention research and knowledge’. Pre-conference methodology workshops were introduced at the conference, on “Testing Mediating Mechanisms and Moderating Factors in Prevention Work” and “Development and Evaluation of Complex Preventive Interventions”. We have received a great deal of positive feedback on the workshops and suggestions for future workshops. The workshops were held in collaboration with the Science for Prevention Academic Network (SPAN) project. SPAN also provided bursaries for early career researchers and sponsored the early career researcher poster prizes. The conference introduced lunch activities, one of the highlights was the presentation on NIDA’s prevention portfolio, by Harold Perl, Chief of the Prevention Research Branch at NIDA. Other sessions were a talk on research funding opportunities that are open to European scientists, EUSPR’s first post graduate student/early career researcher forum, and symposiums on Transportability of evidence-based programmes, and Screentime related prevention research. Please see the 2013 conference pages for further details of the conference, including the programme, conference booklet, conference and workshop presentations. Details of the 2014 conference will be available on the EUSPR’s website during the coming weeks. Please contact us to be added to the conference distribution list. 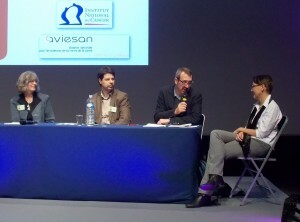 The conference was co-organised with INPES (French Institute for Prevention and Health Education), MILDT (Interdepartmental Mission for the fight against drugs and drug addiction), INCa (French National Cancer Institute), IReSP (French Institute For Public Health Research) and Aviesan (National Alliance for Life Sciences and Health). Pre-conference workshops were in collaboration with SPAN.